Background: Intramedullary nailing is an accepted method of management for femoral diaphyseal fractures. There are, however, risks associated with surgery such as nonunion, infection, and venous thromboembolism (VTE). Objectives: Our objective was to identify independent predictors of complications following intramedullary nailing of femoral diaphyseal fractures in young adults. Patients and Methods: During a 3-year period, 59 patients (aged 13–55 years) underwent intramedullary nailing for high energy femoral diaphyseal fracture. These patients were identified from a radiographic database. Patient demographics, socioeconomic status, smoking status, alcohol intake, diagnosis of diabetes, intravenous drug use, fracture comminution, and if it was open were recorded retrospectively. Complications assessed were nonunion, deep infection, VTE, amputation, and revision of the nail. Results: Univariate analysis identified that socioeconomic status, excess alcohol intake, intravenous drug use, fracture comminution, and an open fracture were predictors of complications. Logistic regression analysis identified that intravenous drug use (P = 0.036) and open fractures (P = 0.05) were significant independent predictors of nonunion. There was a trend toward significance (P = 0.07) for excess alcohol intake as a predictor of deep infection. Fracture comminution (P = 0.015) was an independent predictor of VTE. Logistic regression analysis failed to identify any significant independent predictors of amputation or revision after adjusting for confounding variables. Conclusions: Intravenous drug use, open fractures, and fracture comminution are independent predictors of nonunion and/or VTE. These patient factors could be used to identify those at risk of nonunion and VTE who may benefit from early preventative measures. The annual incidence of femoral fractures exclusive of the hip is 37.1/100,000 person-years, of which diaphyseal fractures account for 8%. The majority are caused by severe trauma and occur most commonly in young patients with a male predominance. Femoral diaphyseal fractures are typically managed with intramedullary nailing, a method of treatment introduced by Kuntscher. This has significant advantages over other methods of management including early mobilization, reduced hospital stay, and reduced morbidity. However, complications are associated with intramedullary nailing which include infection, nonunion, malunion, limb shortening, femoral neck fracture, proximal diaphyseal comminution, and pseudoarthroses, which were frequently observed during the development of the technique. Unfortunately, despite improved technology and surgical techniques, orthopedic surgeons are still faced with the consequences of adverse outcomes of intramedullary nailing, particularly nonunion, infection, venous thromboembolism (VTE), amputation, and revision of the nail. It is, therefore, important that surgeons explore whether the management of femoral diaphyseal fractures can be improved, both surgically and medically, to reduce complication rates. The aim of this study was to identify independent predictors of complications after intramedullary nailing of femoral diaphyseal fractures in young adults. The data for this study were obtained during normal clinical follow-up within the health-care system of the reporting country; hence, ethical approval was not required. We identified 59 adult patients (aged 13–55 years) who had sustained a high energy femoral diaphyseal fracture that were subsequently treated with intramedullary nailing over a 3-year period (2008–2010). These patients were retrospectively identified from a radiographic database (Kodak © picture archiving and communication system) at the study center; patients out with the study area were excluded as follow-up of these patients would be incomplete. Demographic data were recorded retrospectively for each patient, which included age, gender, employment status, smoking status, alcohol intake (excessive defined as >30 units/week), whether the patient had diabetes mellitus, and if they were an intravenous drug user (IVDU). In addition, we also recorded the postcode for each patient and assigned each patient a socioeconomic status using the Scottish Index of Multiple Deprivation. This index takes into account: employment, income, crime, housing, health, education, and access to services, and patients were allocated to a social quintile according to their postcode, which ranged from deprivation decile one (most deprived) to ten (least deprived). The mechanism of injury, fracture pattern, presence of comminution, and whether it was closed or open was recorded from the original radiographs and patient notes at the time of injury. Patients were reviewed both clinically and radiographically until union of the fracture by the treating consultant orthopedic surgeon. Five major complications were defined: nonunion, infection, VTE, amputation, and patients that had revision surgery (nail failure). These were recorded from the patients' notes postoperatively. Statistical analysis was performed using the Statistical Package for the Social Sciences version 17.0 (SPSS Inc., Chicago, IL, USA). Parametric tests were used to assess age for significant differences between groups as this linear variable demonstrated a normal distribution, using a Student's t-test. Pearson's correlation was used to assess the correlation between linear variables (age and decile). Dichotomous variables were assessed using a Chi-square or Fisher's exact test if one variable was <10. Multivariate logistic bivariate regression analysis was used to identify independent predictors of outcome; all predictors were entered into the model using forward stepwise conditional methodology. P ≤ 0.05 was set as our level of statistical significance. The mean age for the study cohort was 38 years old (standard deviation (SD) 12.2). There were 41 (69.5%) male and 18 (30.5%) female patients. The mode decile for the deprivation score was 5 (minimum 0 to maximum 10), with a mean of 4.0 (range 2–9, SD 1.6). Eleven patients (18.6%) were unemployed, nine (15.3%) were smokers, seven (11.9%) consumed more than 30 units of alcohol per week, a single patient (1.7%) suffered with diabetes mellitus, and three (5.1%) were IVDU at the time of their injury. Ten patients (16.9%) sustained comminuted fractures, and eight (13.6%) were open, of which two were grade I, three were Grade II, and three were Grade III. There were 31 complications in total experienced by 22 patients. There were 7 nonunions, 5 deep infections, 4 VTE events, and 2 amputations, and 13 patients underwent revision surgery. Of the two amputees, one was undertaken in a previously fit patient who sustained a closed comminuted fracture and underwent revision with exchange nailing, for presumed nonunion although the indication for this was not stated in the patient notes. The second was undertaken secondary to deep infection in a patient with a known history of alcohol abuse. Social deprivation (P = 0.048), presence of an open fracture (P = 0.016), and IVDU (P = 0.003) were all statically significant predictors of nonunion on univariate analysis [Table 1]. The only statically significant (P = 0.04) predictor of deep infection was excess alcohol, but there was also a trend toward significance for older age as a risk factor [Table 1]. 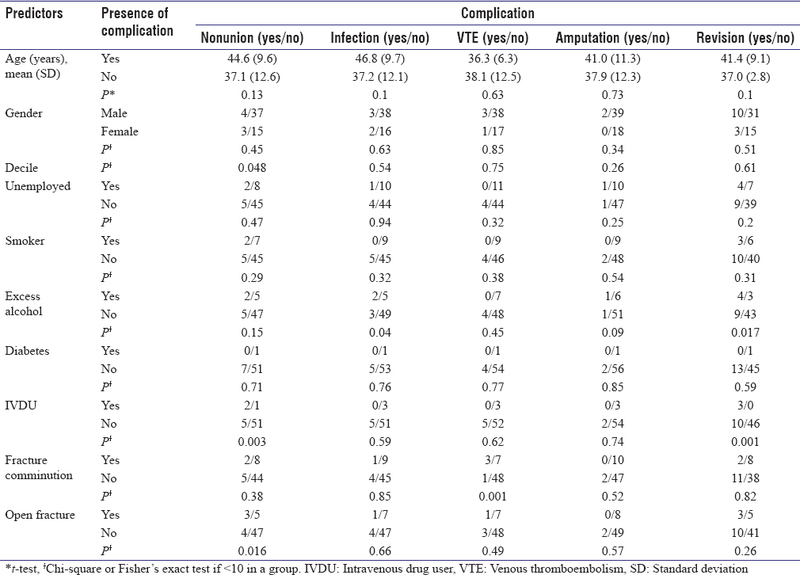 Fracture comminution was the only significant (P = 0.001) predictor of VTE [Table 1]. There were no statically significant predictors of amputation, but excess alcohol demonstrated a trend toward significance for an increased risk of amputation [Table 1]. Excess alcohol (P = 0.017) and IVDU (P = 0.001) were significant predictors for revision of the nail; older age also demonstrated a trend toward significance as a predictor of revision [Table 1]. Regression analysis confirmed that IVDU (P = 0.036) and open fractures (P = 0.05) were isolated independent predictors of nonunion after femoral shaft fractures stabilized using an intramedullary nail [Table 2]. There was a trend toward significance (P = 0.07) for excess alcohol intake as an independent predictor of deep infection postintramedullary nail fixation of a femoral diaphyseal fracture [Table 3]. Fracture comminution (P = 0.015) was confirmed as an independent predictor of VTE postoperatively [Table 4]. There were, however, no significant independent predictors for amputation or revision after adjusting for confounding variables. Nonunion of femoral shaft fractures following intramedullary nailing is a serious complication of surgery. Exchange reamed intramedullary nailing is currently the treatment of choice for most cases of femoral diaphyseal nonunion. It carries a low morbidity and allows full weight-bearing with active rehabilitation. Augmentative plate fixation with or without bone grafting has been described to counter rotational instability , but should be used with caution when intramedullary nailing has been performed. The combined use of plating with nailing would place at risk the periosteal and endosteal blood supply, respectively, to the fracture site. A study of 35 femoral nonunions managed primarily with intramedullary nailing, demonstrated that bone grafting alone proved insufficient and that dynamization predisposed to limb shortening, leading them concluded that exchange nailing was the treatment of choice. Our data demonstrated that an open fracture is an isolated independent predictor of nonunion of femoral shaft fractures stabilized using an intramedullary nail, a result consistent with other published literature. In a recent case–control study by Taitsman et al., 46 femoral diaphyseal nonunions following intramedullary nailing and 92 healed fractures (controls) were used to illustrate that an open fracture is a significant risk factor for nonunion. Open fractures may coexistent with other risk factors for nonunion such as fracture comminution and increased infection risk due to contamination. A recent study by Struijs et al. found that an infected nonunion of the femur predominantly occurs as a consequence of severe open fractures with extensive comminution and segmental bone loss or after internal fixation of a comminuted closed fracture. Studies reporting exchange nailing or plate fixation combined with bone grafting at the stage of revision show good results, but few have discussed bone grafting plus intramedullary nailing as a primary measure. Mitchell et al. reported 31 open femoral fractures with significant bone loss and concluded that satisfactory results could be achieved in the majority of such fractures by treatment with initial debridement and skeletal stabilization with further procedures, including bone grafting. However, a recent study by Song  followed 50 patients with comminuted femoral fractures treated with primary bone grafting and intramedullary nailing showed 100% union with an average union time of 5.6 months and perfect functional recovery, thus concluding this to be a preferable treatment method. Given the evidence to support the association between open femoral shaft fractures and nonunion following intramedullary nailing, which is confirmed as an independent predictor in our cohort, patients may benefit from primary bone grafting if possible or early exchange nailing if there are no signs of union. We found that IVDU was an isolated independent predictor of nonunion after femoral shaft fractures stabilized using an intramedullary nail. Haug and Schwimmer  theorized that drug abuse adversely affects bone healing secondary to impaired nutrition and circulation. We were unable to identify published literature specifically examining the effects of IVDU on outcomes of fractures and management strategies to minimize those effects, suggesting that more research is required regarding this association. Clinicians, when managing femoral fractures in IVDU, should be aware that rates of nonunion are significantly increased in this group. Our data showed that there was a trend toward significance for excess alcohol intake being an independent predictor of deep infection postintramedullary nail fixation of femoral diaphyseal fractures. There is a paucity of studies examining the association of alcohol excess and deep infection in trauma patients and of those that exist the results appear to be conflicting. A study on the nature and healing of tibial shaft fractures in alcohol abusers found no difference in complications' rates, including deep infection, between patients who abused alcohol and those who did not. Conversely, a study of 40 displaced proximal humeral fractures found that 10% of cases managed operatively developed deep infection and were subsequently found to be alcohol abusers. Patients who abuse alcohol are at risk of infection secondary to a number of factors including malnutrition, liver disease and immune compromise. Poor nutritional status has been shown to be associated with an increased risk of postoperative infection in orthopedic patients; a recent study of 213 total knee replacement (TKR) patients demonstrated a significant association between triceps skinfold thickness and postoperative infection risk. While this may be more predictable in an elective setting, clinicians should be aware of an increased risk of infection in trauma patients who abuse alcohol. The VTE has several well-recognized predisposing factors, notably surgery and trauma, and is responsible for a significant number of deaths each year. Figures from the Global Orthopaedic Registry in 2010 showed that deep vein thrombosis (DVT) was the most common in-hospital complication for arthroplasty patients (total hip replacement 0.6% TKR 1.4%) and among the most common complication postdischarge. The mainstay of treatment for VTE is anticoagulation, and guidelines advocate the use of low-molecular-weight heparin, unfractionated heparin, or fondaparinux, dependent on risk factors for individuals. However, chemotherapeutic agents are not without their drawbacks, including bleeding and hematoma formation which may lead to infection, further surgical intervention and subsequent morbidity. As such intermittent compression devices have been widely used to good effect as demonstrated by several studies in terms of reducing the risk of symptomatic VTE disease and in some cases resulting in lower mortality when compared to pharmacological agents. Our data confirmed that fracture comminution is an independent predictor of VTE postoperatively following intramedullary stabilization of femoral shaft fractures. A recent study of 54 patients with DVT following a lower limb fracture showed that 18.5% were comminuted. A higher degree of comminution is typically associated with high-energy trauma, which increases the risk of more extensive soft-tissue and vascular injuries. In a prospective study following 113 seriously injured trauma patients, Knudson et al. showed that patients who developed VTE were older, spent more hospital days immobilized, received more transfusions, and had clotting abnormalities on admission. Analysis of the current best available evidence investigating the administration of fondaparinux following joint arthroplasty or hip fracture surgery demonstrated a slight increase in the number of bleeding events when compared with enoxaparin. A recent review of 127 patients with pelvic or acetabular fractures receiving either fondaparinux or enoxaparin showed a higher occurrence of VTE and also higher mean number of units of blood transfused postoperatively in the enoxaparin group, with no increase in adverse bleeding events in those patients receiving fondaparinux. These findings have been further supported by other studies which have also shown fondaparinux to compare favorably to compression devices as well as eliminating the risk of heparin-induced thrombocytopenia. Furthermore, the robust analysis has shown fondaparinux to be more cost effective for the health-care system as a prophylactic agent against thromboembolism following major orthopedic surgery. A further prophylactic modality to consider is the use of inferior vena cava (IVC) filters to protect against a pulmonary embolism. Their use is controversial, and current practice guidelines are conflicting, resulting in variation in practice. A recent meta-analysis representing 1900 trauma patients, using the meta-analysis of observational studies in epidemiology criteria, showed a decreased likelihood of pulmonary embolism among trauma patients who receive IVC filters but was unable to conclude for or against their routine use. Another systematic review of the literature completed using PRISMA guidelines to evaluate complications of DVT prophylaxis in trauma was similarly inconclusive, noting the disadvantages of IVC filters including filter migration, IVC occlusion, and vessel wall damage and that complex trauma patients require multiple prophylactic techniques. Given that young patients suffering femoral fracture treated by intramedullary nailing are clearly a group at risk of VTE events, particular care must be taken to ensure optimal prophylaxis during treatment. The available literature would suggest that the best approach is to use multiple techniques, including chemotherapeutic and mechanical, tailored to the individual with risk stratification. The use of agents such as fondaparinux may be considered with departmental hematology advice. This study has demonstrated that IVDU, open fractures, and fracture comminution are independent predictors of nonunion and or VTE after intramedullary nailing of femoral diaphyseal fractures. These risk factors could be used to identify patients at risk of such complications potentially allowing preventative measures may be employed. Arneson TJ, Melton LJ 3rd, Lewallen DG, O'Fallon WM. Epidemiology of diaphyseal and distal femoral fractures in Rochester, Minnesota, 1965-1984. Clin Orthop Relat Res 1988;234:188-94. Karadimas EJ, Papadimitriou G, Theodoratos G, Papanikolaou A, Maris J. The effectiveness of the antegrade reamed technique: The experience and complications from 415 traumatic femoral shaft fractures. Strategies Trauma Limb Reconstr 2009;4:113-21. Hak DJ, Lee SS, Goulet JA. Success of exchange reamed intramedullary nailing for femoral shaft nonunion or delayed union. J Orthop Trauma 2000;14:178-82. Ueng SW, Chao EK, Lee SS, Shih CH. Augmentative plate fixation for the management of femoral nonunion after intramedullary nailing. J Trauma 1997;43:640-4. Hakeos WM, Richards JE, Obremskey WT. Plate fixation of femoral nonunions over an intramedullary nail with autogenous bone grafting. J Orthop Trauma 2011;25:84-9. Pihlajamäki HK, Salminen ST, Böstman OM. The treatment of nonunions following intramedullary nailing of femoral shaft fractures. J Orthop Trauma 2002;16:394-402. Taitsman LA, Lynch JR, Agel J, Barei DP, Nork SE. Risk factors for femoral nonunion after femoral shaft fracture. J Trauma 2009;67:1389-92. Struijs PA, Poolman RW, Bhandari M. Infected nonunion of the long bones. J Orthop Trauma 2007;21:507-11. Mitchell SE, Keating JF, Robinson CM. The treatment of open femoral fractures with bone loss. J Bone Joint Surg Br 2010;92:1678-84. Song GH. Treatment of femoral fractures by bone grafting from trochanter and interlocking intramedullary nail fixation. Zhongguo Gu Shang 2010;23:950-1. Haug RH, Schwimmer A. Fibrous union of the mandible: A review of 27 patients. J Oral Maxillofac Surg 1994;52:832-9. Nyquist F, Berglund M, Nilsson BE, Obrant KJ. Nature and healing of tibial shaft fractures in alcohol abusers. Alcohol Alcohol 1997;32:91-5. Zyto K, Ahrengart L, Sperber A, Törnkvist H. Treatment of displaced proximal humeral fractures in elderly patients. J Bone Joint Surg Br 1997;79:412-7. Zhang P, Bagby GJ, Happel KI, Raasch CE, Nelson S. Alcohol abuse, immunosuppression, and pulmonary infection. Curr Drug Abuse Rev 2008;1:56-67. Font-Vizcarra L, Lozano L, Ríos J, Forga MT, Soriano A. Preoperative nutritional status and post-operative infection in total knee replacements: A prospective study of 213 patients. Int J Artif Organs 2011;34:876-81. Abad Rico JI, Llau Pitarch JV, Rocha E. Overview of venous thromboembolism. Drugs 2010;70 Suppl 2:3-10. Cushner F, Agnelli G, FitzGerald G, Warwick D. Complications and functional outcomes after total hip arthroplasty and total knee arthroplasty: Results from the Global Orthopaedic Registry (GLORY). Am J Orthop (Belle Mead NJ) 2010;39:22-8. Zywiel MG, Johnson AJ, Mont MA. DVT prophylaxis: Better living through chemistry: Opposes. Orthopedics 2010;33:643. Xu ZQ, Li Y, Liao RZ, Fang YZ, Liu ZH. Clinical analysis of preoperative deep venous thrombosis (DVT) complicated lower extremity close fractures. Zhongguo Gu Shang 2010;23:52-4. Knudson MM, Collins JA, Goodman SB, McCrory DW. Thromboembolism following multiple trauma. J Trauma 1992;32:2-11. Tsiridis E, Gamie Z, George MJ, Hamilton-Baille D, West RM, Giannoudis PV, et al. Early postoperative bleeding in polytrauma patients treated with fondaparinux: Literature review and institutional experience. Curr Vasc Pharmacol 2011;9:42-7. Lu JP, Knudson MM, Bir N, Kallet R, Atkinson K. Fondaparinux for prevention of venous thromboembolism in high-risk trauma patients: A pilot study. J Am Coll Surg 2009;209:589-94. Gordois A, Posnett J, Borris L, Bossuyt P, Jönsson B, Levy E, et al. The cost-effectiveness of fondaparinux compared with enoxaparin as prophylaxis against thromboembolism following major orthopedic surgery. J Thromb Haemost 2003;1:2167-74. Rajasekhar A, Lottenberg R, Lottenberg L, Liu H, Ang D. Pulmonary embolism prophylaxis with inferior vena cava filters in trauma patients: A systematic review using the meta-analysis of observational studies in epidemiology (MOOSE) guidelines. J Thromb Thrombolysis 2011;32:40-6. Datta I, Ball CG, Rudmik L, Hameed SM, Kortbeek JB. Complications related to deep venous thrombosis prophylaxis in trauma: A systematic review of the literature. J Trauma Manag Outcomes 2010;4:1. Online since 05 Sep 2017.